You are currently browsing the The Pet Product Guru blog archives for the day Friday, August 17th, 2018. After losing a beloved pet sometimes we wonder when it’s the best time to adopt another one. Thesprucepets.com has put together a comprehensive checklist to help you get through the process. First of all, take the time to experience your grief. It’s normal to be sad, angry, or lonely for a while. It’s also okay to feel relieved and sad at the same time, especially in cases when your recently deceased dog suffered from a long or serious illness. Avoid trying to immediately fill the void with a new dog when you have not processed your feelings over the loss of your last dog. You might end up projecting negative feelings onto your new dog or having unreasonable expectations. Instead, wait until you feel a sense of peace about your previous dog’s death. Yes, you may still be grieving. However, it’s best to be at a place where you are processing your grief and it does not dominate your life. If you have any remaining pets, consider them before you add another dog to your home. Remember, that dogs grieve too (and so do other pets). Your dog (or other pet) may feel sad and lonely without his companion, but that doesn’t mean a new dog will help. In some cases, bringing a new dog in the home before your dog is ready can cause quite a disruption. Watch your remaining pets closely for the days to weeks following your previous dog’s death. Look for subtle changes in personality, activity level and appetite. Make sure they are not showing any signs of illness. Once you are confident they are back to their normal selves, only then should you consider adding a new dog to your home. Once you get your new dog, be sure to introduce all pets gradually and carefully. Try to get an idea of what your life is now like without your dog. Are there goals or plans that you put off because of the care your previous dog needed? Maybe now is the time to take that long vacation or sabbatical. Does your home need repairs or renovations? Perhaps it’s a good time to revisit previous plans for going back to school, changing jobs, or relocating. It’s better to make any lifestyle changes before adding a new dog to your life. Then, if and when the time is right, you can find a dog that is right for your new lifestyle. Once you feel that the time is right, you can begin the process of choosing the right dog. Avoid running out and getting the first dog you meet and like. Before you look for a new dog, determine the age, personality, energy level and size of your ideal dog. Decide what factors are the most and least important to you. ​Adopting a dog can be a wonderful idea. Many dogs in rescue groups have been living in foster homes. The foster owners can usually give you a pretty good idea of what to expect from each dog. Your beloved dog can never be replaced, but a new dog can be a beautiful way to share the love in your heart. Some people find that the heartbreak of losing a dog was too difficult to ever go through again. Sadly, they may choose to no longer have pets. However, most people realize that they want to continue sharing their lives with dogs. 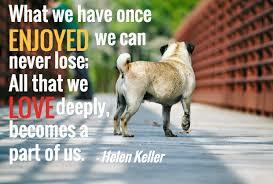 By opening your life up to a new dog in need of a home, you are honoring your dog’s memory. The human-canine bond is a beautiful thing. Enjoy your new canine companion. Thanks to thesprucepets.com for providing this valuable information. We are remembering Aretha Franklin today on Edgewater Gold Radio. We’ll be starting each hour with an Aretha Franlkin song beginning at 10:00 am Eastern time. All of your favorite oldies play all the time on Edgewater Gold Radio-–Download the free Edgewater Gold Radio app and take us along wherever your go. Listen on our website: edgewatergoldradio.com.